Magnesium is known to be one of the most critical minerals that can be found in the body. Magnesium helps the body’s different cells make energy, stabilise membranes, and your muscles to relax. Due to its role as a cofactor in over 300 enzyme systems, a deficiency in magnesium can lead to a wide variety of symptoms. Among these are insomnia, nausea, anxiety and irritability, muscle weakness and fatigue. Other popular symptoms also include instances of muscle twitching and cramps, high blood pressure, migraines and headaches, diabetes, fibromyalgia, and chronic fatigue. Today’ s typical diet contains very little magnesium and is one reason we are often deficient in this mineral. Magnesium is also readily lost due to excess alcohol, salt, coffee, prolonged or intense stress, diuretics, antibiotics, and other drugs. Most people benefit from an intake of between 400 – 1000mg of magnesium per day. Foods which are high in magnesium include seaweed, nuts, collard greens and beans. And to properly absorb magnesium, we also need adequate amounts of Vit B6, Vit D, and selenium. The most absorbable forms of magnesium are magnesium citrate, magnesium aspartate, and magnesium glycinate. Avoid magnesium combined with carbonate, sulphate, or oxide, which are poorly absorbed and are most commonly found in cheaper forms of magnesium supplements. Magnesium can also be absorbed through the skin, so taking a hot bath with epsom salts (magnesium sulphate) is also a great way to relax and let your body take in all that magnesium goodness. Any deficiencies related to magnesium can promote headaches. Interestingly, people who experience migraine headaches have lower levels of serum and tissue magnesium than those who do not. The American Academy of Neurology and the American Headache Society concluded that magnesium therapy is “probably effective” for migraine prevention. I have received many reports of people benefitting in the clinical setting, by taking magnesium supplements. 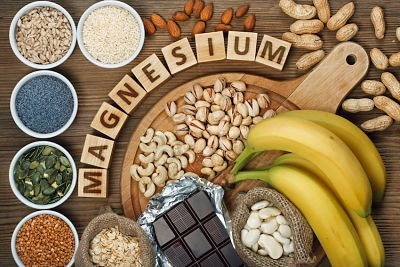 For certain conditions such as kidney disease or severe heart disease, you should check with your treating practitioner if supplementing with magnesium would be suitable in your case.